Local authorities in European cities and regions are at the forefront when it comes to implementing regulations and best practices to decarbonise Europe’s energy sector. 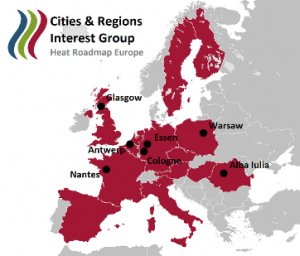 In order to support local authorities in this challenging task, HRE has set up a Cities and Regions Interest Group (CRIG), composed of cities and regions that have shown ambitious efforts over the years. Members of the CRIG receive tailored advice for low-carbon heating and cooling solutions and at the same time serve as an example of how HRE results can be applied at the local level and provide guidance for others.The cooperation with the cities will ensure an adequate reflection of local challenges, scenarios and circumstances. Interested cities and regions are encouraged to get in touch with alexandra.pfohl@iclei.org for additional information on the CRIG. Alba Iulia, Romania. Find out more here. Antwerp, Belgium. Find out more here. Cologne, Germany. Find out more here. Essen, Germany. Find out more here. Glasgow, United Kingdom. Find out more here. Lille, France. Find out more here. Murcia, Spain. Find out more here. Nantes, France. Find out more here. Strasbourg, France. Find out more here. Province of Treviso, Italy. Find out more here. Warsaw, Poland. Find out more here.